First published in 1976, the Dictionary of Philosophy has established itself as the best available text of its kind, explaining often unfamiliar, complicated and diverse terminology. Thoroughly revised and expanded, this fourth edition provides authoritative and rigorous definitions of a broad range of philosophical concepts. Concentrating on the Western philosophical tradition, The Routledge Dictionary of Philosophy offers an illuminating and informed introduction to the central issues, ideas and perspectives in core fields such as metaphysics, epistemology, and logic. It includes concise biographical entries for more than one hundred major philosophers, from Plato and Aristotle through to contemporary figures such as Dummett, McDowell, Parfit and Singer. All major entries are followed by helpful suggestions for further reading, including web links, and contain extensive cross-referencing to aid access and comprehension. This edition also features a brand new guide to the most useful philosophy sites on the internet. 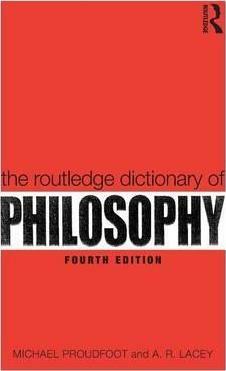 The Routledge Dictionary of Philosophy is an invaluable and up-to-date resource for all students of philosophy. Michael Proudfoot is an Honorary Fellow of the Department of Philosophy at the University of Reading, UK. A.R. Lacey is formerly a Senior Lecturer in the Department of Philosophy at King's College, University of London, UK.